Another month and here we are with another favourites post. September has brought with it a change in season and as a result I’ve overhauled my skincare routine. I recently revisited LUSH and fell back in love with the store and all its goodness. Why did I ever fall out of love with LUSH? Quite simply, I would describe myself as an “optimistic pessimist” and I found the full-on friendliness of the LUSH staff to be both intimidating and awkward (says more about me, right?). However, now I shop with toddler twins in tow and I actually find the staff positivity and willingness to shake Jelly in my kids faces oddly reassuring. Most importantly my skin is loving my rediscovery of LUSH. 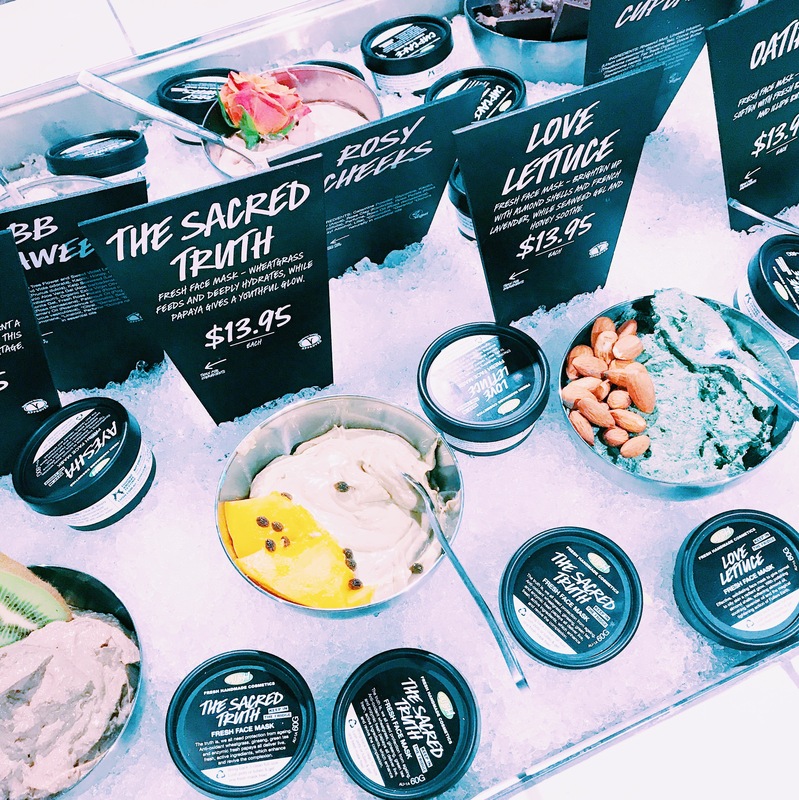 LUSH Products in their classic B&W packaging- Return 5 clean tubs and receive a fresh face mask for free. Nothing is more important to skin health in changing seasons than exfoliation. If your skin is not being adequately exfoliated it could lead to dead skin cells combining with skin oils and the outcome? Unsightly blackheads and clogged pores and even ingrowing hairs. To keep dead skin cells at bay I’ve been using this yummy tub of goodness. The main active ingredient is sea salt which is mineral rich and so not only exfoliates but also brightens the skin. What do I love about this product? Firstly, I can adjust the exfoliation depending on my skin needs- used dry it gives an intense scrub and when diluted with water its finer and more suited for regular use. Secondly, its multi-purpose, I have used this several times as a shampoo and the result is Hair so big and voluminous that it puts Marge Simpson to shame (plus the minerals do incredible things for scalp health). You know that phrase “You can sleep when you’re dead”? I hate it! I want to sleep now, I want to savour every slumber, I want to drift off comforted and awake refreshed and soothed. You can’t benefit from a good nights sleep when you’re dead. So, if you value your sleep and want a lotion to incorporate into your whole families bed time routine then this is it. A bed time story and glass of warm milk in a tub. You only need to read my post (Coco)nuts about oil pulling… to get that I really rate coconut oil. I genuinely believe it has the power to restore a multitude of problems (if only it could restore my bank balance after a Sephora spree). This hand scrub combines the power of coconut oil with mineral rich sea salt, creating a intensive treatment to be used on wet hands every few days. Its cured my “Mum hands” and now I’m considering a new career modelling OPI products- ’nuff said. ….It took all my willpower not to eat it! My name is Jen and I am a scrub addict. Okay, so this is an exfoliant heavy post, but as the weather changes you have to buff. If you’re heading into warmer weather then your lips may become dry in the sun. Using a sugar scrub like this keeps lips smooth and hydrated, follow with an SPF lip balm. If you are transitioning into cold weather then you risk chapped lips, this could seriously interfere with Pumpkin Spiced Latte consumption and so to avoid this use this scrub daily and follow with a rich lip oil or balm to provide an additional moisture hit. (*Sings) Sugar! Aha, honey, honey…. Once I got over the inuendo laden name, I fell head over heels for these toothpaste substitute tablets. The wild rose and orange flower took a little getting used to. However, the freshness and clean feeling I experienced was like nothing ever before. I recently took these on a rather epic road trip (if you followed on Insta stories you know what I’m talking about, if you didn’t then its a story for another day) and these were the most convenient way to keep my teeth sparkly and my breath fresh along the way. Rumours are these are being discontinued- such a travesty! Stockpile now people….go go gooooo! Be sure to check out the LUSH Halloween Range its not to be missed. Fingers crossed I will be featuring the Feline Fine Body Bar in my October favourites. What products have seen you through September? Are you a LUSH fan and if so what is your personal favourite? Let me know in the comments section. Next Post Wearing Black and White: Styling tips and inspiration for ever-chic fashion.